PETALING JAYA: In response to a catastrophic earthquake and tsunami that has struck the city of Palu in Sulawesi, Mercy Malaysia has announced it will deploy a relief team to provide assistance. It is appealing for funds from the public so that it can provide aid to the people there. Mercy Malaysia president Datuk Dr Ahmad Faizal said that the organisation's Indonesian partner, PKPU Human Initiative, is assessing the needs on the ground as plans are in place to deploy the first team by Tuesday. "Food and temporary shelters are believed to be the most immediate needs, while mental health and psychosocial support will be an important aspect of the community's recovery in the next six to 10 months," said Faizal. "Hospitals, like all other buildings are declared unsafe, so patients are being treated in the open ground, exposed to the elements. "We urgently appeal for donations from caring Malaysians which will enable us to provide immediate relief aid, such as safe drinking water, food and temporary shelter." Donations can be made to Palu Relief Fund (MBB 5621 7950 4126) on Malaysia's website www.mercy.org.my. All contributions are tax-exempted. On Sept 28, a magnitude 7.5 earthquake struck Palu, Indonesia, triggering tsunami waves of up to 5m in height which then hit the island of Sulawesi. 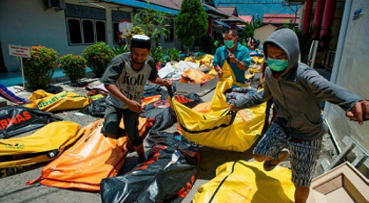 The national disaster agency placed the official death toll so far at 832, with 540 people badly injured within Palu itself, but warned that the toll would rise. Mercy Malaysia is a non-profit organisation focused on providing medical relief, sustainable health-related development and risk reduction activities for vulnerable communities in both crisis and non-crisis situations, both locally and internationally.